Here is Perfect DBX Converter for You! There are several third-party tools available to convert DBX files to Outlook; amongst them is DBX Converter which is intended to help you in case you want to convert DBX files to Outlook. Using this software you can convert Outlook Express to various formats like RTF/MSG/EML easily and quickly. 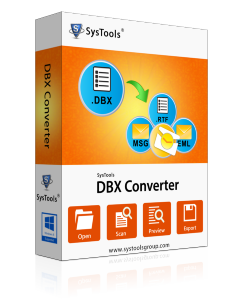 An Apt Tool: DBX Converter is an apt solution to convert .dbx file to .pst. This DBX to Outlook converter tool has capabilities to Transfer DBX files to Outlook in just few clicks. This DBX converter software is successfully compatible with all the latest versions of Windows OS - Windows 7, Vista, XP, 2003, 2000, ME, 98. After using this converter DBX to PST and after you transfer DBX files to Outlook you can read Outlook Express emails in Microsoft Outlook & Thunderbird easily & effectively. You can rely on this tool as it is easy to perform with zero risk involved. The tool is efficient to convert OE to Outlook. If you want to know how to convert .dbx file to .pst with us, you will be able to know yourself because software employs easy steps to convert DBX to PST. In case you face any difficulty in using DBX Converter services , you can contact our support section, which has extensive knowledge regarding software. Our support section is available 24X7 to guide you and assist you. You can clear all your doubts here. DBX Reader - DBX file reader tool to read *.dbx files and extract *.dbx files to *.eml, *.msg, *.rtf files or convert to *.pst file which is readable in MS Outlook. DBX to PST Conversion - Convert DBX file from Outlook Express to Outlook files of MS Outlook to read *.dbx files in MS Outlook. DBX to EML Conversion - DBX to EML conversion to import DBX files of Outlook Express to EML files so as to read DBX files in ThunderBird etc. Conversion of all email metadata information - Export Outlook Express emails with email metadata information (To, Cc, Bcc, From, Sent & Received date, Attachments).